This smooth paté has a delicate taste and texture even finicky felines will adore! That’s because tender chicken is the first ingredient, which is an excellent source of animal protein. Then we added delicious, whole food ingredients like fiber-rich pumpkin which is good for digestion, along with pure sunflower oil and apple cider vinegar. This delectable canned diet also provides essential moisture, which helps ensure your cat consumes enough water as well as promoting proper urinary tract health. Health Extension Grain Free Chicken & Pumpkin Recipe is ideal for adult cats of all breeds. 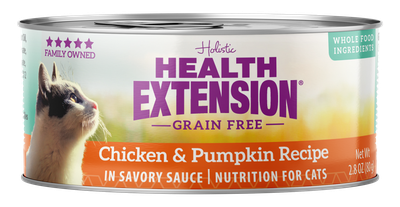 Holistic Health Extension Grain Free Chicken & Pumpkin Recipe is formulated to meet the nutritional levels established by the AAFCO Cat Food Nutrient Profiles for growth and maintenance. Adult: Feed according to the age, size and activity of your cat. Feed 3 & 3/4 cans per day for each 5lbs of body weight. Kitten: Feed up to twice the adult amount to kittens.